I was born in the Year of the Snake. Even among the Chinese, that news can sometimes be greeted with “eee”s and awkward jokes–I guess that very few people like them, and I purposefully went against that grain if only to have some pride in my Chinese astrological sign. Then, the first time I touched a friend’s pet snake (I no longer remember what kind), I fell in love and was filled with awe. They are wonderful creatures to the touch, if you feel safe with them and approach without pre-conceptions. So I am bummed that yesterday (a challenging day), my dream of the preceding night was me under attack from a gigantic snake (a foot in diameter, to say nothing of its length) and watching it change in colour and size twice. It began in a garden (as it always does?). In the dream, I was faced with the gift of a peach blossom tree. Someone had chopped it in its trunk, leaving all its branches, flowers and fruit intact. It seemed like a waste of a tree not to save it and put it back in the ground, though of course, it would take a miracle now that it was missing its roots. My “father” in the dream grabbed the fibres at the bottom of the severed trunk and yanked, and root-like features came loose. Maybe now it could be saved. We then tried to find a free spot in our garden, which unfortunately had a lot of tree- and ground-cover already. There didn’t seem to be a free spot, until I saw a fertile black patch of soil in one corner next to an ornamental pond filled with koi. As I looked, I realised it was a huge black snake, like a full-grown anaconda, curled up in a hole in the ground. Its size was, frankly, epic. It moved, and there was no time for me to react as it lunged straight for me. It struck me, tangling my legs and taking me down, and I felt a little bite on my left hand–strangely without pain. I was sure it could swallow me, or inject enough venom to kill me in seconds, and I was just hoping anyone watching would not be traumatised by the swiftness of my death. Don’t mourn for me! I was brought down by a gigantic grand black snake, what a way to go… the light, it’s fading… waitaminut, I’m still alive. I had survived, and realised that I had no idea what species of snake this was, and maybe I was just lucky to survive its one bite and the cuddling it was giving me. That, surely, was enough, and I wanted to be untangled now. But it was not done. But neither could I escape. 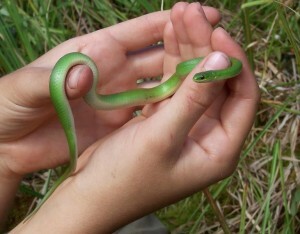 I couldn’t get away from the snake because it was now a small green one. Everything was a flurry, and it was slick–and gave me another bite. I was getting annoyed now, still not knowing its species, if it was venomous, and if its second bite would kill. I was tired of being a snake chew-toy. We untangled. I grabbed a weapon, and it turned out to a piece of metal shaped like a square bracket [, something steel, with holes at its ends and that looked like some sort of carpenting or structural brace or reinforcement. One of the ends had also had its edges sharpened to resembled a blade–I didn’t want to hurt the snake, but if it lunged again, that force against my weapon would maybe hurt and discourage it. I have some guesses as to the meaning of the dream, and we’ll see how events play out to prove my suspicions right or wrong. Unfortunately, the swiftness of all the snake-related actions made this largely a negative dream just filled with me reacting in self-defence, even though there is a lot of promising meaning in the peach tree, the “fertile black soil”, my surivival, the reduction of the threat, and the smaller green snake (the colour of healing) giving me a second bite (an antidote for the poison before?). It could also be a flattering thing that I’m being told I do not need braces/weapons/reinforcements, even if I didn’t greet that idea with enthusiasm! This is also the second dream in months that my left hand has received injury. I need to keep working on that. As with all symbols, I think any analysis of a snake in a dream needs to be done in relation to the other elements and the environment. My magically changing snake was in the “home garden” with trees, pond and fish, and originally mistaken as fertile soil. I don’t think it was a “mistake” that I thought it was soil, but it may be a spot that needs my attention before any peach tree can be planted.